I’m certain you are trying to get everything ready for the holidays. Don’t panic, but add a stop at the liquor store to your list… because I have a present for you! 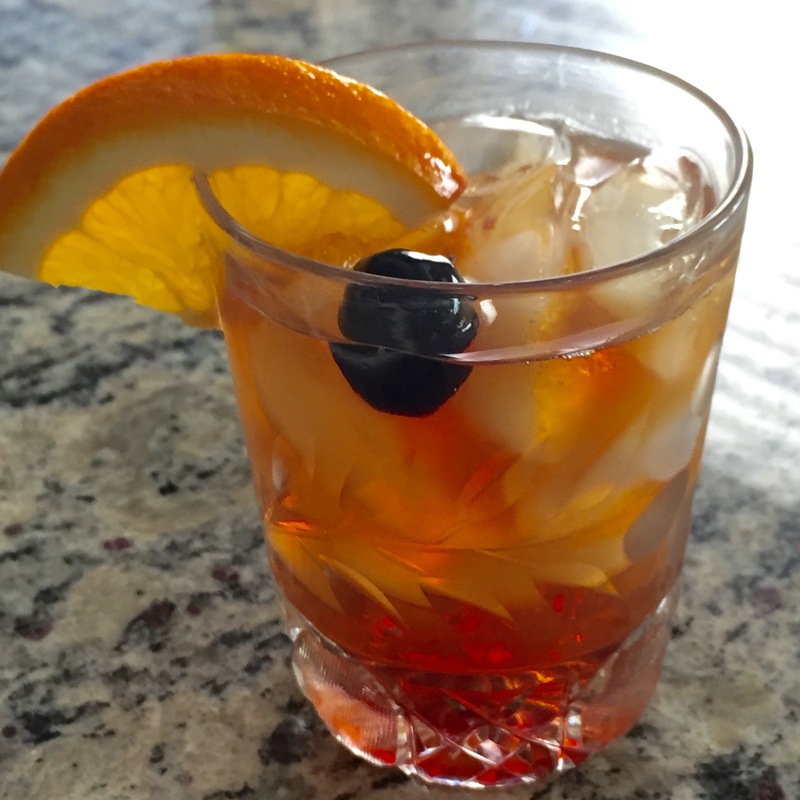 Nobody would ever call me old-fashioned, but I have developed a crush on Old Fashioneds, and have learned to make them and share them. Now my friends are as excited about them as I am. This drink has been around since 1880, and has been credited to a bartender who brought the recipe to the Waldorf-Astoria Hotel bar from a private social club in Louisville, Kentucky. I want to share my version with you. 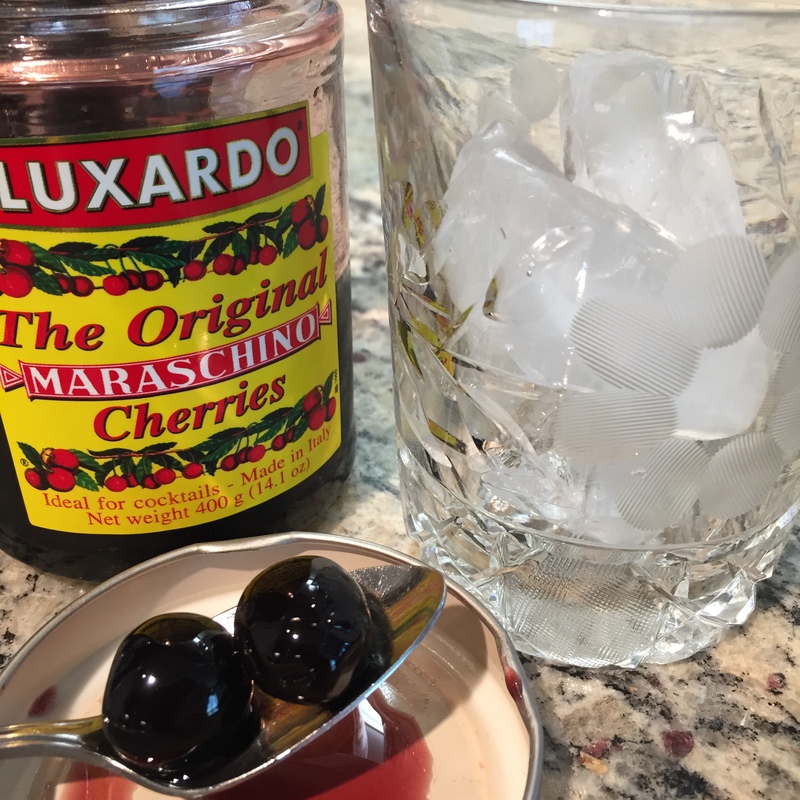 If you like bourbon, and want to indulge yourself and your friends, the Luxardo cherries I use elevate the cocktail to new heights! I balked when I saw their cost for the first time, but like diamonds and caviar, they cost what they cost – and there is no substitute. I love to serve them in my sweetie’s leaded crystal rocks glasses, inherited from his Dad. The weight of the glass, their design, the caramel color of the bourbon, and the almost-black Luxardo Cherries, which taste of almonds, make it a sensory delight. Perfect for celebrating any special occasion! 2 splashes Angostura Bitters, 2 splashes Orange Flower Water (optional). Shake two or three times, gently, then pour over ice in a rocks glass. Add a slice of orange to the rim. Retrieve a Luxardo cherry from the jar (allowing some syrup to come along with it, so it may settle onto the drink with it’s cherry) then decorate your cocktail. Hand this beauty to your holiday guests and be prepared for lots of compliments. I wonder how I ever lived without the luxury of these Luxardo cherries? They are heavenly. I have been promising this forever, and I have finally typed it out for you! When I began looking for something to do with a 6 lb. bag of tangerines I impulsively bought at the grocers this winter, nothing appealed to me until I saw a stunning cake on a blog called The View from Great Island. And it was wheat-free! I faithfully copied hers the first time, but felt I could change a few things and make it taste better to me. At cake number four I knew I had gotten it just the way I love it. I’ve made them as gifts for friends, I trust this recipe that much. You can even do the fruit one day, and put the cake together the next. Note: You must have a food processor and a 9” springform pan to make this cake. Prep the tangerines by washing them and placing them whole in cold water, bringing them to a boil, then simmering for 15 minutes. Drain, cover them with cold water again, and repeat process. Drain, rinse with cold water and set aside to cool. When you can handle them, cut them up, discard any seeds and place in food processor bowl fitted with steel blade. (I did this on a plate so I didn’t lose any of the juice.) Clean the sides of bowl once or twice as you puree. Measure out the one cup of tangerine puree you’ll need. In one large bowl, I beat the eggs, sugar, baking powder, salt, vanilla and almond extract and tangerine puree. Then I add the almond flour and scrape it all into a greased or buttered spring-form pan to which I have added a piece of parchment paper cut to fit the bottom. Bake in a 350 degree oven for approximately 50-60 minutes. 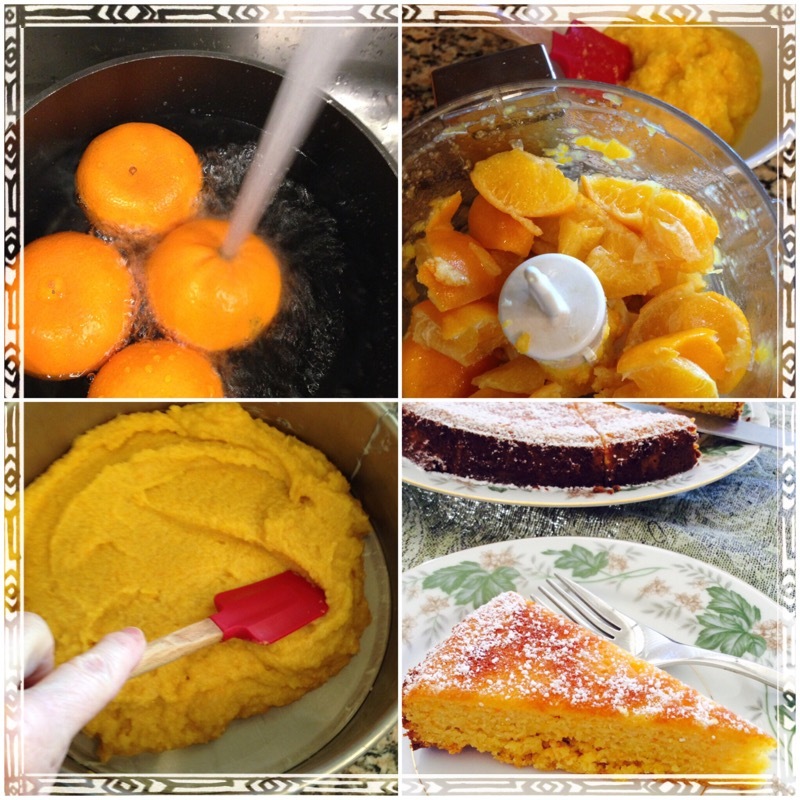 It will be a gorgeous golden brown, and a toothpick inserted into the cake will come out clean. Cool the cake in the pan for 10-15 minutes, then run a knife around sides, and remove them. cool cake on a wire rack, still on bottom of pan. When cool, I invert onto a plate, leaving it bottom-up. 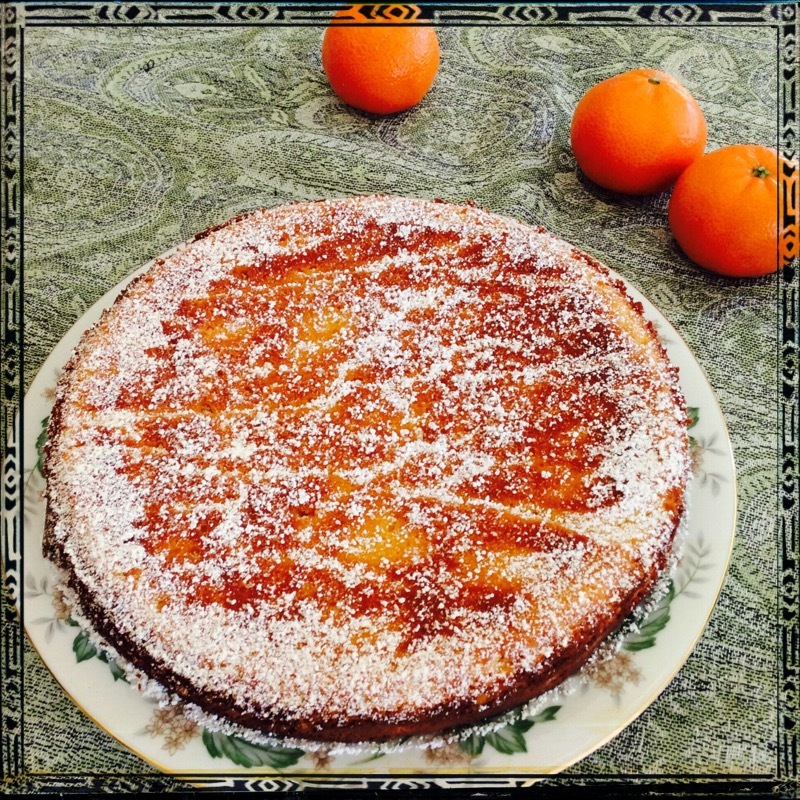 Dust with confectioners sugar and garnish with a twist of peel or two from another tangerine. It’s very rich and can serve from 8-12 people. I’ve also served it with a dollop of mascarpone or unsweetened whipped cream. I hope you love it as much as I do. Please let me know what you think after you’ve made one!